There is no single highlight of this set. With about 4900 updated packages almost everything is updated. Again. Take it slowly, and good luck. Is once again massive, so is available here. If you find manjaro32 useful please consider donating to, or helping out with, archlinux32. It’s a small team taking on a huge project and any help will no doubt be very much appreciated. Why aren’t the available packages/package versions the same as x86_64? I’m only packaging current LTS kernels. Any marked as EOL are dropped. I’ll not be building the mainline kernel. Something broke. Isn’t this meant to be stable? “Stable” means “infrequently changing”, not “everything will work perfectly all the time”. If you want it to mean everything works, you need to help test the things you’re interested in. Is there a valid current i686 ISO to do this with? I’ve tried using the older manjaro-kde-17.0.6-stable-i686 to chroot with, which afaik was the last one built before i686 was officially dropped. Being a very old package base, with an old version of pacman, I think it corrupted my pacman database, multiple times. There’s an 18.0.0 image linked in the OP. That should work OK.
How safe it is to do this last update now on the testing branch? Is there any risk if I am using linux414 (I did not understood that table of the available kernels)? that kernel is still supported so it’s as safe as any other update. this is not a testing branch announcement though so you should check the latest announcement for that unless you want to change from testing to stable. Update on 1 System without Problems. 1 VB Freezed during Update but can fix it. I have two vbox VMs using the testing branch, both updated without issue. As always though if you are not confident take a backup first, better to have it and not need it than … you know. No gui start, just blinking cursor. Satellite A135-S4427 with Intel T2250. Tried downgrading mate-desktop, xorg-server. Don’t know how to troubleshoot. Don’t know how to troubleshoot. then start a new thread. Probably its the same issue which left unresolved on testing branch. Please check the journalctl of your faulty boot (journalctl -b-1 for previous boot) and refer there which causes this blank screen. One possible solution is to disable plymouth and see how your system boots then. PS. Mine blank screen problem was gone after last full upgrade today on testing branch. So probably you will need to wait until this solution reaches to stable branch. Upgrading Manjaro 32 from 18.0.0 to 18.0.2 many GTK windows become garbage, even rendering the system unresponsive. 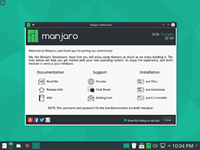 For example Manjaro Hello shows no content, and opening Pamac settings freezes the system. Menulibre switches become garbage after clicking on them while using a stock XFCE theme. It also happens on the 18.0.2 live USB, but not in the 18.0.0 one.